So with each passing day I find more and more things my hubby and daughter can eat. Today I actually made mayonnaise from scratch. 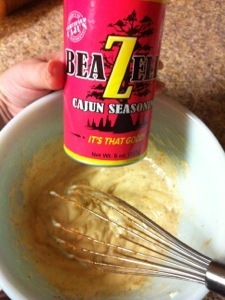 I added some Beazell’s Cajun Seasoning and it is actually pretty good. Next time though I think I will use a light extra virgin olive oil instead of vegetable oil. For bread we use croissants. Another plus is you do tend to lose weight not eating all the carbs. I eat the same thing that they do, no way am I cooking two different meals.